When I want to listen to music outdoors, I don’t want to be limited by being close to an extension cord for power. At the same time, I don’t want to have to deal with wires or cables or keep an eye out to make sure something doesn’t fall, which pulls the plug off of this thing, causing this other thing to fall. And maybe I want the music to be playing for some nice outdoor ambiance instead of just listening through headphones. 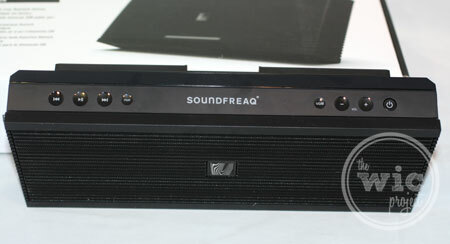 The new SoundFreaq Sound Kick portable speaker system uses a Bluetooth connection and battery power to eliminate those fussy variables. Talk about portable. No cables needed! We’ve been doing a bit of construction on the property, which offered the perfect opportunity to test out the Sound Kick. Before using the Sound Kick, make sure you plug it in to charge the batteries (they recommend charging for at least 12 hours before you first use it.) Next, you’ll need to pair the Sound Kick with your Bluetooth enabled devices, such as your iPod or Smartphone. To pair the two, you’ll hit the “Pair” button at the top of the Sound Kick and then use your phone’s/iPod’s Bluetooth settings to discover and sync the two together. Once connected, you can use the Sound Kick to play and control your music with the convenient buttons at the top of the speakers. I was impressed by the quality of sound that the Soundfreaq Sound Kick provided. Even when cranked up to it’s max, I couldn’t hear any distortion in music. It was loud, clear, and allowed us to work outside to music (which always makes everything go faster.) Being able to use the buttons to navigate through songs was great because it meant we could put the iPod Touch in a safe, out of the way place while we listened to the music. Since the Soundfreaq is battery powered (while still being surprisingly light weight), it really allowed us to take our music with us – whether it was just sitting in the yard or working in the woods. While we didn’t push it to it’s 7 hour battery life, we were able to listen to music for about 5 hours without any problems. If you would like to pick up the Soundfreaq Sound Kick, it retails for $99.99 and can be found nationwide at Target, Radio Shack, Walmart, and Sears. 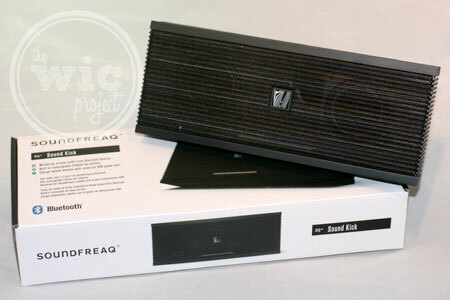 You can also purchase it online at the Soundfreaq e-store, other online retailers, or buy the Soundfreaq Sound Kick with optional case from Amazon.com for just $119.99. The Sound Kick is available in black, as well as three new Chromatic colors that give it an extra pop of color (Sunset, Ocean and Twilight), and the all-white Ghost edition. With lengthy holiday wish lists rolling in, Soundfreaq offers a budget-friendly option for under $100 with its award-winning Sound Kick portable, wireless speaker. Compatible with any Bluetooth device, the Soundfreaq Sound Kick speaker enables the whole family to listen to their favorite holiday tunes with full, clear sound. 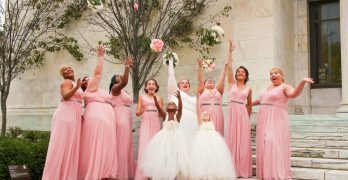 No need to attach your iPod or smartphone since the wireless speakers allow you to keep your device with you at all times. Available in various colors, the Sound Kick speakers sleek design satisfies every family member’s style while staying within a budget. Disclaimer: I wrote this review while participating in a blog tour by Mom Central Consulting on behalf of Soundfreaq and received a product sample to facilitate my review. My 10 year old would love this and I would spend the day yelling turn it down Please!